’Aimakapa Fishpond is one of two fishponds at Kaloko-Honokohau National Historical Park. The other is Kaloko Fishpond, which is separated from the ocean by a huge rock wall, currently being restored. ’Aimakapa Fishpond’s barrier is made up of sand dunes. 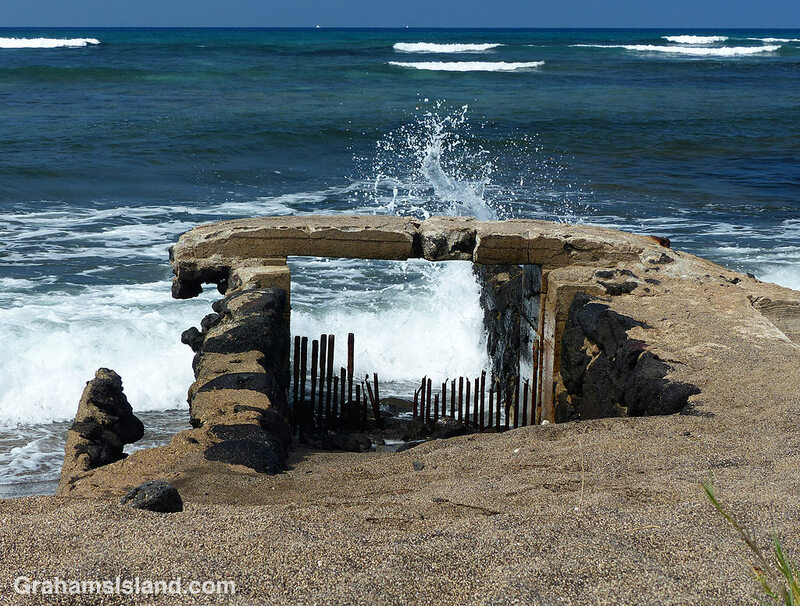 A channel was dug to the ocean to allow water to circulate back and forth and, at the ocean end (seen here), a sluice gate (makaha) installed. The sluice gate helped keep predators out. These days it isn’t used and so the channel has silted up with sand. Fishponds are different to fish traps. Ponds allow for the rearing of fish from small fry. Traps are shallow walled enclosures, which fish can cross at high tide, but cannot escape from when the tide goes out. For more information about Kaloko-Honokohau National Historical Park, go to www.nps.gov/kaho/index.htm.